Jember Regency is a regency (kabupaten) of East Java, Indonesia. The population was 2,346,498 at the 2010 Census. 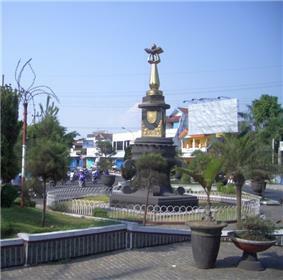 Its administrative capital is the urban area of Jember, which with 332,611 inhabitants in 2010 is the third urban area in East Java province (after Surabaya and Malang) but does not have municipality or city status. Jember is famous for its tobacco farms and traditional food called tape which is made of fermented cassava. Jember Regency has a total area of 3,293.34 km² (329.333,94 Ha). It shares its borders with the regencies of Lumajang (to the west), Probolinggo, Bondowoso and Situbondo (to the north), and Banyuwangi (to the east). To the south lies the Indian Ocean, where the regency includes the island of Nusa Barong, located just to the south of Java. The University of Jember is located in the regency. There were 2,346,498 people living in Jember Regency (at the 2010 Census). The population density is about 712.5 people/km². Jember Regency is one heterogeneous area where many ethnic groups are mingled and live together. Most of its population are Javanese and Madurese people, with a small percentage of ethnic Chinese, Balinese, Arabic and Indian. Most citizens speak the Javanese language or the Madurese language, and sometimes a mixed dialect of both Javanese and Madurese languages. Many citizen speak Indonesian for official and business purposes only, and to communicate with non-Javanese or non-Madurese people. Every year Jember run Jember Fashion Carnaval. In the tenth carnaval in 2011, there are more than 600 participants walked on street catwalk along Sudirman street (Central Park), Gajah Mada street up to Jember Sport Hall as the world longest 3.6 kilometers catwalk. An expansion of dormant Noto Hadinegoro Airport has been verified for reuse/operational in June 2014. The airport now has 1,560 meters runway and ready to serve up to ATR 72/600. ^ "Kemenhub Verifikasi Bandara Jember". June 27, 2014.